MTV is headed back to the beach. Deadline reports the network has renewed Jersey Shore Family Vacation for a third season. The reality show reunites the cast of Jersey Shore as they embark on yet another summer vacation. Returning cast members include Pauly D, Snooki, JWoww, Michael Sorrentino, Ronnie Ortiz-Magro, Vinny Guadagnino, and Deena Nicole Cortese. The season two finale of Jersey Shore Family Vacation debuts on MTV tonight, December 13th, at 8 p.m. ET/PT. Season three is slated to debut in 2019. What do you think? Do you watch Jersey Shore Family Vacation? Are you glad it’s coming back? 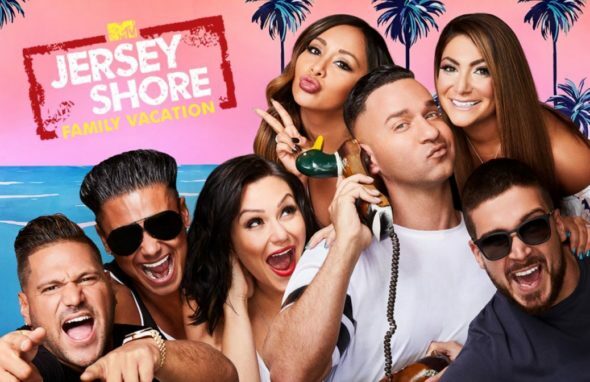 More about: Jersey Shore Family Vacation, Jersey Shore Family Vacation: canceled or renewed?, MTV TV shows: canceled or renewed?